Vintage rugs have become quite popular in recent years and I have to say, I’m 100% on board. I recently bought a couple vintage rugs and am totally smitten. But I had a lot of questions too. How do you clean a vintage rug? Should they cost more or less than a new rug? Is this rug even old or was I duped? 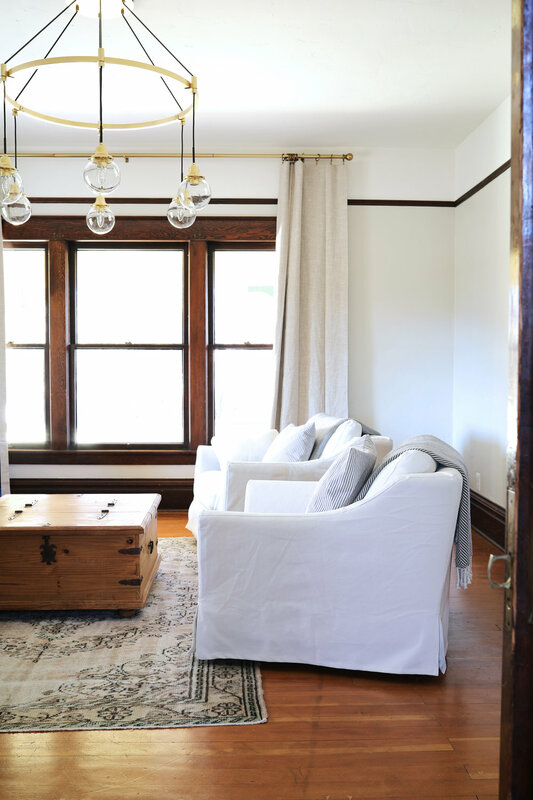 I figured you guys probably have some of the same questions, so I turned to Kristi of Olio Collective, an online vintage rug shop, to share her wisdom. Read on for our interview. For the record, I think vintage rugs are beautiful. I love that they add a touch of history and ware to a space, but what I love best is that they’re made of real materials and reusing them means less waste in the landfill. If you haven’t gotten into vintage rugs, hopefully Kristi’s guidance on how to find/price/clean/care-for them will encourage you. So…take it away Kristi (of Olio Collective)! What do you look for in a vintage rug? Any tips and tricks that we can implement? Buying a vintage or antique rug is truly like buying a piece of art. It is completely subjective to the buyer’s taste. Some folks would pay a million dollars for a Jackson Polluck, while others may not see the value in it. For the shop, I buy great quality, authentic Persian and Turkish rugs that I think would complement any style of home. A quick way to check if the rug is truly vintage or antique, is by taking a peek at the underside of it. If you notice the knots are all uniform and the fringe is sewn on, the odds are you’re looking at a machine-made rug. A hand-knotted rug will have uneven sized knots as well as fringe that is woven in. The last thing you want to do is invest in a vintage rug that is not actually vintage. As a homeowner, how can I find reputable sellers? I've heard horror stories about rugs showing up smelling awful or being cut from a larger rug. Unfortunately, I’ve heard of that happening more often than not, and it’s usually because someone thought they were getting a fabulous deal off of eBay. The best advice I can give is to look at reviews, and make sure to only purchase from shops that allow returns. To me, when a shop has a no-return policy, that translates into they don’t fully believe in the product they are selling and may be manipulating pictures or descriptions in order to make for an easier sell. Once you find a rug dealer you like, stick with them. You’ll know the quality of product you’re going to receive and they’ll also get to know your tastes. Finding the perfect vintage rug is hard… really hard, so having a dealer who is willing to be your personal shopper is invaluable. What about price? How would I begin to know what I should pay for a rug? Should they cost more or less than new wool rugs? Would you pay more for a print of the Mona Lisa or the original painting itself? Obviously, the original. It’s the same for a vintage rug. Many, many years ago, someone sheared a sheep, produced natural dyes from vegetables, then spent months, or even years weaving it into a piece of art. If you gawk at a rug because it is $1000, divide that by the time it took to produce, let’s say 30 days x 10 hours per day = 3000 hours, the hourly wage of the worker was $0.30. 30 cents! What you should expect to pay is anywhere between $400-$10,000 depending on the size and where you buy it. Either way, always know you are investing in something that is only going to go up in value, and since the trade sanction with Iran was reinstated, now is the time to buy before Persian rugs become even more expensive. How do you clean vintage rugs? And how often should it be done? To care for your vintage rug, you should give it a good vacuuming every few days to keep the dirt from settling in. Every few years, you should get it professionally cleaned by someone that specializes in antique rugs. That is an art in itself and something I like to leave to the professionals. 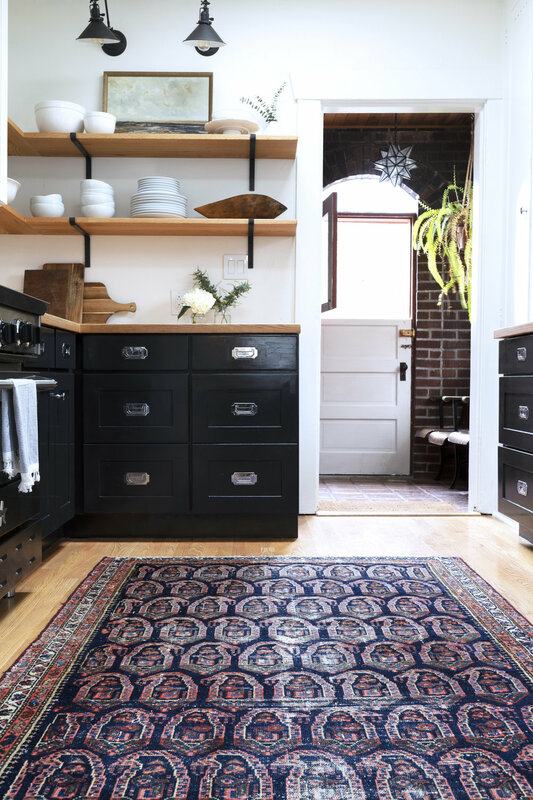 Remember these rugs have seen more life than most of us, and are incredibly durable, so don’t worry about them being fragile or high-maintenance. What if I got a rug at a estate sale for $15 and it stinks (true story)? Any suggestions for getting the smell out? Oh, no! I would definitely leave that to the professionals, they know all the tricks for dealing with questionable odors! Cathy’s note: I laid the rug out in the driveway (in full sun) and sprinkled a box of baking powder over it. I let it sit for a day, turned it over, and repeated the process. After a couple of days, I brought the rug inside and vacuumed it like crazy. That seemed to do the trick. Just like any rug, you want to make sure to turn them, so high traffic areas and areas exposed to a lot of sun are catching a break and wearing evenly on the rug. Other than that, I’m sure fresh air is good for them, but regularly vacuuming is your best bet for increasing the longevity of your rug. Any other info worth sharing with customers? 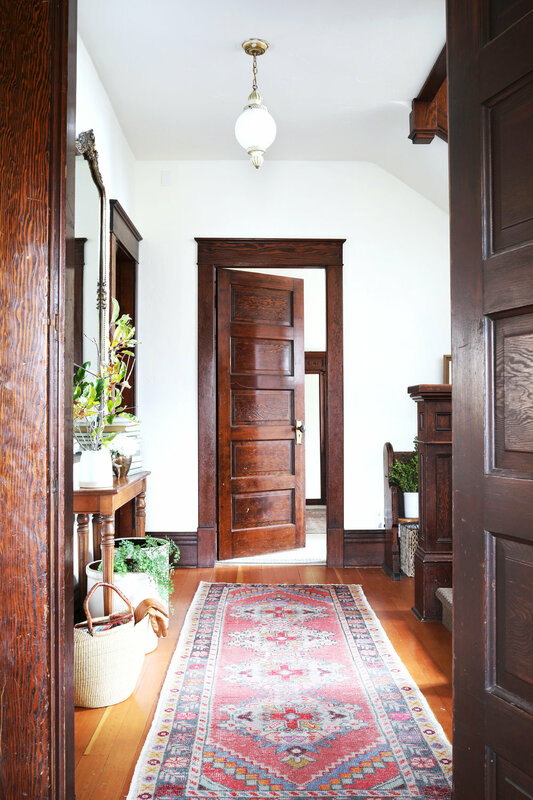 The biggest takeaway about vintage rugs is that they are 100% worth your investment. They are true collectibles and will give your home the most enchanted feeling. The quality, durability and uniqueness is unmatched. If you’re having trouble finding your perfect rug, definitely reach out! I love being down in the rug rabbit-hole and would love nothing more than to match you with your dream rug! Thanks so much, Kristi! For those of you interested in vintage rugs, I highly recommend you check out Kristi’s shop on Etsy and Instagram!